This week, Lovin’ Spoonfuls reached another milestone — we rescued our 8 MILLIONTH pound of food! 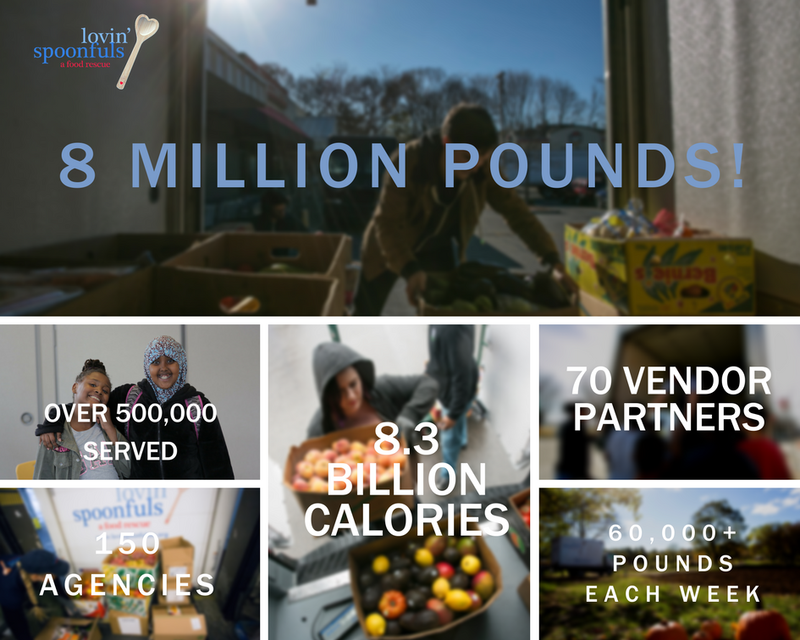 That’s over a billion more calories since August that our team has picked up and distributed to hungry people across Eastern Massachusetts. We’re so proud of our amazing food rescue coordinators who make it all happen! Vinny started towards Monday’s milestone by rescuing 512 pounds from Costco in Everett, while Cathy rescued 305 pounds of food from Target in Watertown. Meanwhile, Anthony, who runs our MetroWest route, rescued 211 pounds from Hannaford Supermarket in Marlborough. We are rescuing more food than ever, thanks to our dedicated partners, allowing us to reach more communities and feed more people. Here’s to the next million!